Summer is rough on women's feet. After spending all winter snuggled in soft, fleecy socks and slippers, our tender tootsies are suddenly unleashed into the elements to fend for themselves: pounding the steamy pavement in the concrete jungle, wandering bare through scalding sands, stuffed into sweaty, skyscraper-tall heels. It's no wonder so many women complain about swollen, achy feet as temperatures rise. Here are three easy tricks I've been using this summer to beat the heat and keep my feet in tip top shape, for health and beauty. My bosses invented The J Wedge to relieve heel pain. He's a marathon runner and she's a physical therapist, so when he developed plantar fasciitis and none of the recommended treatments (custom orthotics, night splints, taping, icing) worked, they decided to come up with something that would not only alleviate the pain, but would be affordable. Plantar fasciitis is a common injury among athletes, particularly runners and basketball players, but it's found in sedentary folks, too, and in people who are on their feet at work all day. I don't fall into any of those categories specifically but I am prone to wearing totally inappropriate shoes from time to time. Flip flops with zero arch support, overly high heels. I know I shouldn't but sometimes they're just so darned cute. But I pay later, with aching, cramped feet. 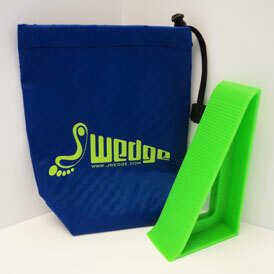 The J Wedge allows me to fully stretch my toes and arches, relaxing the fasciia. So. Much. Better. I stretch with the J Wedge 3x/day when I know I'm going to wear iffy shoes. Since I hit my 30s, I have gradually developed horrible craggy old lady feet. My heels are rough and dry, no matter how often I moisturize them. It's pretty icky. 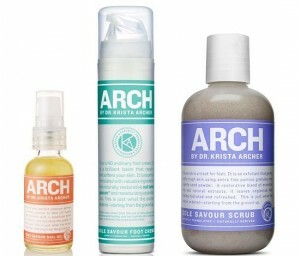 Luckily, I discovered the ARCH line of foot care products from NY Podiatrist Dr. Krista Archer. I've tried a lot of foot scrubs and creams over the past few years but this system is by far the most effective. Even better, the products are all naturally-derived, paraben and sulfate-free, made from essential oils and extracts. They smell amazing! The Sole Savour Scrub uses extra fine pumice granules and rosehip seed powder to exfoliate dead skin cells, lavender, rosemary, oregano, thyme extracts as natural antiseptics to deodorize and refresh, and cinnamon bark and goldenseal extracts for anti-bacterial and anti-fungal properties. The Sole Savour Nail Oil relies on tea tree oil for a natural antiseptic. I'd never thought about using a cuticle oil on my toe but it really does seem to help, overall, and makes my pedicures last longer. The Sole Savour Creme is rich and emollient. It keeps my heels smooth and soft- making a noticeable difference after just two uses. It's also great for the kp bumps on the backs of my arms. This set is not cheap but if you've had trouble finding something that works, it might very well be worth the investment. This is a personal choice, of course, but I tend to think that a little color on your toes makes for a happier world. One of my friends' husbands has a total disdain/phobia about polished nails so I suppose I wouldn't recommend this for her but everyone who is up for a little glitz and glamor should check out all the crazy nail color options on the market right now. 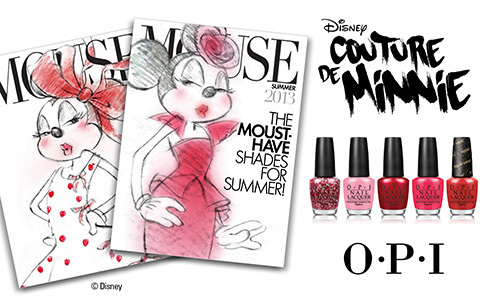 One of my current faves is the Couture de Minnie collection by Opi, inspired by the world's best loved polka dot-wearing mouse. I really love the Minnie Style glitter polish on pampered toes. The red, white and pink dots sparkle and make me smile. Do you have any special summer tricks to keep your feet happy and healthy? In accordance to the FTC Guidelines and the WOMMA Code of Ethics, I am disclosing that I received samples to facilitate this review. No compensation was received, aside from the fact that I work for the folks who created the J Wedge. All opinions are, as usual, entirely my own.